On 7-9 June 2019, more than 500 football fans will unite to cycle 145 miles over two days, finishing at Amsterdam’s Johan Cruijff Arena. It’s an opportunity to meet like-minded people and most importantly raise money to beat a disease killing one man every 45 minutes. *Get £50 off the registration fee using code: EARLYBIRD50 when you register today. Prostate cancer kills 1 man every 45 minutes – that’s two men during a football match – but it doesn’t have to be this way. 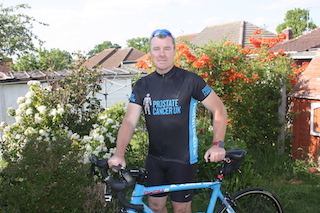 The aim is turn the game around for men everywhere – to stop prostate cancer being a killer. Help us turn the game around and relegate prostate cancer forever.